Cool Hand Burg: Mr. Costello, We Salute You . . .
Mr. Costello, We Salute You . . . 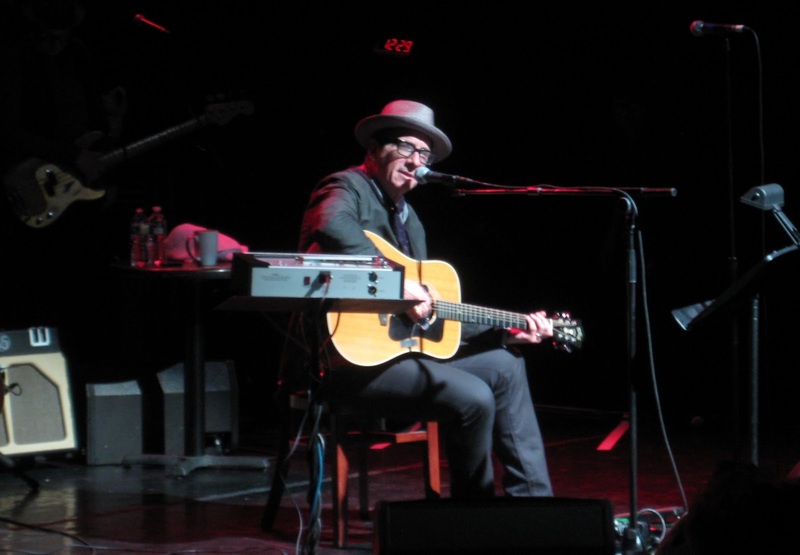 The Burgs ventured out a little later than usual Friday night, but it was for a good reason: Elvis Costello put on a last-minute concert at the Gramercy Theater. It started at 11:15 pm -- well past our traditional "wind down" hour and pretty much smack dab into the middle of what we call "bed time." As evidenced by the digital clock on the stage (see picture, just above Elvis' head), it was a little late. It wasn't even his first his first gig of the evening, it was his third (he made surprise guest appearances at two other concerts earlier in the evening). The clock read 1:01 am by the time Elvis and his band left the stage. He has a lot more energy than you'd expect from a 56-year-old man, a lot more energy than, say, the Burgs . . . We were thoroughly impressed. Apparently, Carnegie Hall was booked.